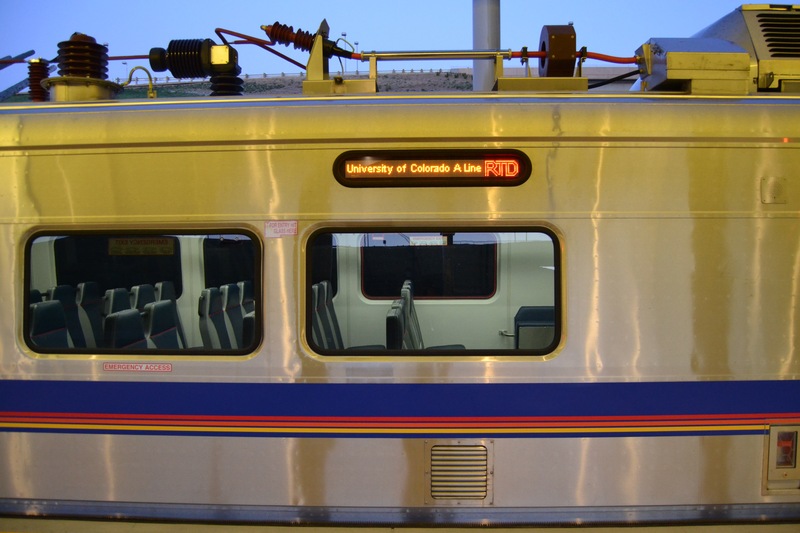 A lot has been made of the $9 fare to get to and from Denver International Airport on RTD’s gleaming new A-Line. As Streetsblog reported a few weeks ago, it’s more expensive than airport rail in comparable American cities, but about the same as in San Francisco. CBS4 and ABC7 did similar stories more recently. For one, it’s a reflection of what it costs to operate the 24-mile airport line: about $42 million a year, according to an RTD spokesperson. RTD estimates that in its first full year of operation, even with the $9 price of a trip, the A-Line will pull in between $8 million and $16 million from fares. And since airport transit tends to serve business travelers and vacationers who can afford it, a higher fare makes sense. But another factor in the A-Line’s fare is RTD’s decision to charge nothing or almost nothing for the 4,300 parking spaces along it. Parking costs transit agencies a fortune — about $15,000 to build each structured space in Denver [PDF]. Plus it will cost the transit agency up to $2 million annually to operate the A-Line’s park-and-rides (excluding the one at 61st and Peña, which is privately owned), according to RTD estimates. By charging so little for parking, RTD is effectively shifting these costs to passengers who don’t park and ride. A new study from the Colorado Fiscal Institute actually recommends increasing the airport fare and charging for parking at the stations. That revenue would help fund discounted fares for low-income airport workers and transit-dependent riders system-wide. Most low-income transit users would not be affected by parking costs. Approximately 25 percent of light rail riders and 53 percent of bus riders are transit-dependent and therefore do not have a need for parking. Most Park-n-Ride users ride the express and regional routes — 64 percent of express bus riders use parking and 48 percent of regional bus riders use parking, and tend to be higher income. Roughly 50 percent of express and regional bus riders live in households with more than $75,000 annual income. By contrast, only 10.2 percent of local bus riders use parking. Free parking at Park-n-Rides disproportionately benefits higher-income riders. Transit advocates have been trying to lower fares for Denverites who depend on transit for a long time. Right now, 68 percent of low-income riders don’t get discounted rates, according to a Mile High Connects report, leaving many to pay full fares. That’s why a small group of protesters disrupted a celebration last week for the A-Line. “We need a way to get here to there,” they sang. One way to help more people get from here to there on transit? Charge more for parking and stop subsidizing driving. But they do charge for parking after the first 24hrs, $2 a day. I will say though, when I visited Salt Lake City a couple of years ago, the price for their light rail from the airport was cheaper than ours but I rode it a couple more times that day and while the ticket was good for a few hours I still ended up paying more than $9 for the day. In 2015, the SkyRide used to be $12, unless you were boarding from Stapleton or Airport Rd I then it was $9, I believe. a) The airport fare actually dropped from $9-$13 depending on the destination to $9 flat a few months ago. e) While $9 is expensive, it’s certainly not unprecedented—in addition to San Francisco, see New York (Newark via NJ Transit, JFK via subway/Airtrain), Vancouver, Toronto, and LA (LAX via Flyaway bus, Burbank via Metrolink) are all in the $7-$10 range. g) None of the A Line park and rides are structured, and probably cost much less than the $15,000/space cited in the article. The no fee parking for less than 24 hours benefits the airport workers most. I wouldn’t call them “high income” riders. The employees can get a placard or register their cars with security. You don’t need an across the board policy to give employees free parking. I think that increasing the fee for stays over 24 hours would be the right approach – the A Line offers great airport travel park and ride and $3-4/day would still be significantly cheaper than off-airport lots at DIA. $2/day is too low and at least on this line it should be easy to make the parking lots profitable. The fare for airport customers is entirely reasonable – for employees the regional day pass/monthly pass covers the airport so they can pay less but I think there should be even lower price monthly passes available for airport employees. One of the reasons it’s so expensive is that the airport is in the middle of nowhere, so the rail line has to be very long (compared to, say, the line to the Chicago airport or the DC airport). But yes, the parking lots should charge for parking. They should never be free. I use a Park-n-Ride every day for my commute to Boulder and realized, with a station that is at best half full every day, the money spent on a parking garage could have easily increased the frequency of the bus that would take me to the PnR (currently hourly), or could have bought everyone on the bus this morning a car, since the parking space I park in cost about 3 times as much as my car. Yes, the A-line is long and expensive, but a great deal of the cost was just parking. It’s time we get a little more realistic about where our transportation dollars are going; It’s not going to buses and trains. Also, to clarify, surface parking lots are not the answer because they are cheaper. Look at the proposed Longmont bus (and maybe train?) station, which is a huge block of pavement that will never be full and could instead support TOD or other development, rather than being an ugly black landscape. Colorado has all this great scenery and we keep paving it over so we can leave our cars somewhere. DIA did increase their parking rates along with building a new parking structure, so I think this helps. We have upcoming travel plans and have been comparing different parking options. I’m am very surprised that to park at this lot for $4/day and riding in on the train $9 each way for 2 people for a 5 day trip comes out to $56 and ends up less cost effective than paying the $8 parking fees at the lots closer to the airport approx. $40. From a cost and time savings perspective it doesn’t make travel sense to pursue this as a viable option for 2 people traveling to the airport and is a wash for 1 person regardless of the low parking fees if we are looking at travel that is less than a week. I don’t feel as though I am understanding the intended audience for this park and ride option.